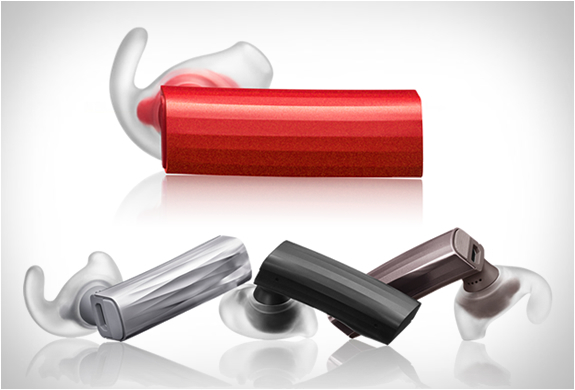 Jawbone, awell known and respected name in the blue tooth game, has updated their great Era earpiece, and it is definitely worth it. The design changed and the featureswere updated. So what makes this Era worth purchasing if you have the early edition, or better yet, why should youpurchase this if you have another blue tooth headset? Let’s start with comfort, because face it, if it isn’t comfortable why buy it. The Era 2 is very lightweight and extremely comfortable. They include a few extra ear bud covers so that you can find the correct fit for your ear. My review unit felt great in my ear and after a few minutes I had forgotten I was even wearing it. The charging case unfortunately only comes in black or silver so you can’t quite color match completely. Unfortunately my review unit did not include the charging case so I can not go into much detail of the aesthetic feel of that portion. Jawbone has set the standard for blue tooth enabled headsets, even having an app available to enhance the functionality of the device. Inside the app you can set up particular behaviors for button presses. Answering a call takes a press, muting the call is a short hold on the button and if you don’t want to be troubled with pulling out your phone to adjust the volume level, just hold the button down and it will cycle through volume levels for you. This is where I favor the Era over the Plantronics Marque 2, there is only one button that controls everything. This to me allows the Era to have a much sleeker design. However, some users may prefer buttons dedicated to each function for ease of use. As far as sound quality, I would have to give the edge to Jawbone again. With HD audio and noise assassin 4.0 technology the sound quality was just amazingly clear. I was able to hear and communicate a full conversation on a motorcycle going 45mph. That was pretty amazing to me. I was barely able to hold a conversation on my motorcycle with the Plantronics Marque 2. Where the Era lacks for me is the integration with Google now. With the technology today, you would think you would be able to have full integration with voice control. However, the only Google now functionality is the ability to say a name and have it dialed. Even if they only added being able to ask for directions and have it play out for you, l would be happy. This is a sore area for the Era, with all the awesome HD audio, and noise assassin cancellation the battery goes quick. Jawbone says 4 hours of talk time, however the best l was able to achieve was a little over 3 hours. The charging case is said to give you up to 10 hours of talk time since you can charge the headset on the go, unfortunately I can not attest to that, however, with slight miss in talk time on a bare model without the charging case l would guess that the total talk time would fall a little short of the 10 hour mark. The Jawbone Era headset is by far the beat quality headset available, but you are going to pay for it also. At $129.99 for the Era and another $49.99 for the portable charging case. The Plantronics Marque 2 comes in at $59.99 and offers similar functionality, with slightly less quality. Me personally l go with you get what you pay for and would gladly pay more for the quality of the Jawbone Era.